...Be very careful when jacking up and supporting your RX-7. The Mazda engineers went to great lengths to build these cars as lightweight as practically possible, and that meant using much thinner metals than you may be accustomed to. The sheetmetal "frame rails" under these cars are made from around 18 ga. sheetmetal, about as thick as your average oil pan. A bend or kink can significantly weaken their stiffness. As they are easily damaged and repair is difficult, it is much better to avoid damage in the first place. ...Now is a good time to get these out, before you do any damage. Thick blankets can also be used, and will prevent any paint damage should a wrench or socket be dropped on the fenders or nose area. ...A little squirt now can save a lot of busted knuckles and cussing later. ...It's best to do this step now, before you melt any wrenches or damage any electrical components. You might as well remove it now too. ...Be sure to drain both the radiator and engine. Catch the coolant in drain pans, not only to save it or dispose of it properly, but to keep the work area neat & clean. Antifreeze does not evaporate very fast, and can hang around for several days if not cleaned up. This can expose both your and the neighborhood's kids & pets to a toxic substance. ...Place blankets or pads on the cowl area of the body and fenders. This will protect your body and paint from accidental contact from the hood as it is being un-bolted and removed. ...Scribe or paint alignment marks around the heads of the hood bolts before removal, as this helps make proper re-installation and alignment much easier. ...Disconnect any wiring harness or hoses that will interfere with the hood removal. ...Have an assistant support the weight of the hood as you remove the bolts. Be very careful to avoid damage to the hood or body if the hood suddenly comes loose as the bolts are removed. ...Remove the hood, being careful to place it in a safe place, and protect the areas that contact the ground from paint chips or other damage. Be sure to thread the bolts back into their holes in the hood, so these special bolts won't get mis-placed. ...While you are still nice and clean, now is a good time to get things ready inside. Remove any screws in the plastic trim around the boot, then carefully pry the plastic cover off to reveal the inner rubber boot and attaching screws. After the screws are removed and the rubber boot carefully pried loose and pulled up, the (4) shifter retaining plate screws can be removed with the 10mm socket, ratchet, and extension. Have a rag handy as the shifter pulls free, so that the oily bottom of the shifter's inner workings can be wrapped to prevent dripping oil on your nice clean carpets & interior. ...While not a necessary step, removing the seats will assure that they are not accidentally stained or otherwise damaged. It will also allow much easier access to the under dash areas to make wiring connections. ...The throttle cable should be dis-connected from the throttle pedal, so thet the cable will be free to removed from the engine compartment side of the firewall. ...Again, while you are inside the car and relatively clean, it's a good time to go up under the dash to dis-connect the clutch master cylinder's pushrod clevise from the brake pedal. Simple removal of the pin is all that's required. ...The above connectors should be saved. They can be later used to make more professional looking connections when the rotary components are installed on/in your V-8. ...Disconnect the harness to the oxygen sensor, as well as the ground strap to the catalytic converter. ...Disconnect the harness connectors attached to the transmisson for the reverse lights & gear position sensors. Automatic equipped cars will also have cooling lines, as well as undercar shift linkage to remove. ...All the exhaust system can be removed between the engine and the rear axle. The bolts/nuts are often very difficult to remove, so be sure to use 6 point sockets and wrenches to reduce the possibility of rounding off the hex. The penetrating oil applied earlier will greatly reduce the risk, but a little extra caution should still be exercised. ...After all the bolts are removed, the pipes can be pulled from their rubber hangers. A little twisting and tugging is all it takes to pull the rubber over the expanded head of it�s mounting stud. ...Before the driveline is removed, be sure to drain the oil from the engine & transmission. This will prevent a big mess later when the engine/trans are pulled as a unit. ...Remove the underbody cover from under the radiator/oil cooler. ...Remove the engine's oil cooler lines. ...Remove the lower radiator hose. ...Remove the nuts & washers from the engine mounts at the subframe. ...Follow the proceedures set forth in the RX-7's shop manual. 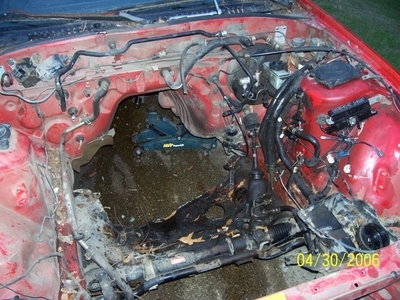 ...Most of the RX-7's emissions harness (passenger side firewall) and all of the RX-7's engine harness can be removed. In the emissions harness, be sure not to disturb the wiring for the wipers, cruise control, and ABS systems. The harness can be slit open and the rest of the wires can be removed. Refer to the electrical section to identify the wire colors. ...Now's the time to clean all those areas you couldn't get to with the pressure washer earlier. Most any cleaner/de-greaser can be used. We use a product like Simple Green, applied by spraying, followed up with scrubbing with a nylon bristle brush, wiped off with rags. This won't take long if you did a good job with the pressure washer earlier. Here's a good example of what can be done as far as detailing goes. 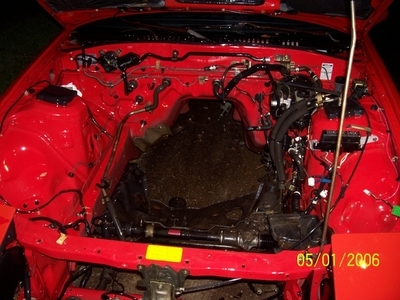 Below are a couple of "before" and "after" pictures sent to us by a customer of the exact same engine compartment. Believe it or not, this engine compartment has not been re-painted, just thoroughly cleaned and detailed. If you don't have time for this sort of thing, you could take your car to a pro after your rotary and other un-necessary parts have been removed and you should be able to expect similar results. The 1" bore clutch master cyl uses a larger diameter pilot and rubber boot, requiring a larger 1-3/8" hole in the firewall for proper installation. Various methods of enlargement have been used...Dremel tool, die grinder, rotary file or unibit in a hand drill, etc...if you elect to use a plasma cutter, be sure to remove the flammable carpeting, backing, etc before proceeding. ...NOTE-...An alternate method some use to get around this task is to simply space the master cyl away from the firewall about 3/8". If you elect to go this route, be sure to seal the area well to keep engine compartment fumes and heat out of your passenger cabin. If you use this method, you will not be able to mount the master cylinder's protective rubber boot. ...Remove all components attached to the round tubular crossmember in the front of the car, with the exception of the oil cooler mount tabs. Removed items include the oil cooler, horns, wiring harness and attaching clips. Save the clips to be used later. A fine toothed hacksaw will quickly remove the welded on tabs close to the tube, and the remaining portions of the tabs can be tapped down flat to the crossmember. ...Tap the oil cooler mounting tabs forward appx 1" (by tapping directly on them w/ the rubber mallet), until they no longer protrude no farther rearward than the rear edge of the round tube they are welded to. ...Re-mount the wiring harness to the rear side of the oil cooler mount tabs. ...Re-mount the horns to the forward side of the oil cooler mount tubes. ...Loosen and rotate the aluminum pipe (w/ attached A/C pressure switch) forward that fits between the condensor core and drier. ...Install the RX-7's condensor core to the new mounting points on the re-location brackets.